I'm not a great wingcar fan....but that has a great look and stance! Proper size rear tyres...lol. Where is THAT ONE now ? 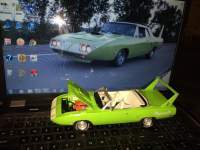 The Mertl Motors Superbird was local to me and the first one that I tried to buy in 1975. The first owner was an older man who thought they only made 50 of them and was out of sight on his price! Just last week I spoke with the third owner and informed him of this picture of the car. Would anyone know how to track down the original picture? Chuck, maybe you can clarify some things on this post. My Daytona was originally orange with a black spoiler. I made the mistake of painting it black but had it restored to the original color when I sold it. The man that bought it said his name was John D'Agostino. He's not the same one I've seen many pictures of. He lived in, I believe he said Warren. A guy called me several years later, I think about 1992 and asked when I was going to let John have it because he was buying it. I said your mistaken, he's had it since January 1987. He was being scammed. Then about 10 years ago some guy, I think he said he was in Connecticut called and wanted to know if I had the build sheet and window sticker, which I do have. He wanted it but I told him it wasn't for sale. Also as far as Harlow Tire we never closed all though the front page article in the Observer was worded that way, we sold out to Monroe Tire and Muffler. We left on Saturday June 25th and they took over on Monday June 27th. They weren't going to change the name but many people didn't read the whole article. The article explained that we retired and sold out. To this day people ask our employees where they're working now. i'm sure I remember seeing another Daytona or maybe it was a C500 used as a pace car , it had a checkered painted roof , think the car was black or red , the current owner discovered it when he removed the vinyl top , pretty sure that's how the story went , think I read it in a magazine / book , this was before wide spread internet 1990s, or at least before I had access to a computer . 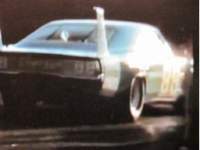 My blue bird was used at Birmingham Intl Speedway as a pace car for 2 years-I have one faded, water-logged picture that isn't worth posting, but the owner of the car at that time (James Cash I think) promises more.